Home> Resource> iOS Transfer> How to Transfer/Sync Music from iPhone to iTunes? iTunes is definitely a good helper for iOS users to mange their media files between desktop computer and devices. And it also works well as a media player on your PC or Mac. However, sometimes you may lose your iTunes library with unknown reasons that you cannot grasp, such as computer crashing, formatting, system reinstallation, or something else. Actually, the reasons of resulting in iTunes library losing are not the emphasis for you, the most important thing for you is to rescue the lost songs to your iTunes library again, but how to reach it? In most situations, when the iTunes library is lost on your PC or Mac, you always find that they still be saved in the iPhone, iPad or iPod without damaging. Thus, transferring iPhone music to iTunes could be the best solution here, right? If you wish to find solutions here, you've been the right place. Part 1. How to Transfer Songs from iPhone to iTunes Library? Part 2. How to Sync Music from iTunes to iPhone 7/6S/6/5S? How to Transfer, Copy Music from iPhone X/8/7/6S/6 to iTunes? As you know, things are not going as your imagine. Just like we mentioned above, iTunes can used as a helper to upload music or songs from computer to your device. But if you're in the contrary situation, it seems to be useless here because of Apple's authority and security protection. Hence, you need to find another way to transfer music from iPhone 6, iPhone 6 Plus, iPhone 5S/5/4S to iTunes on Windows or Mac computer. 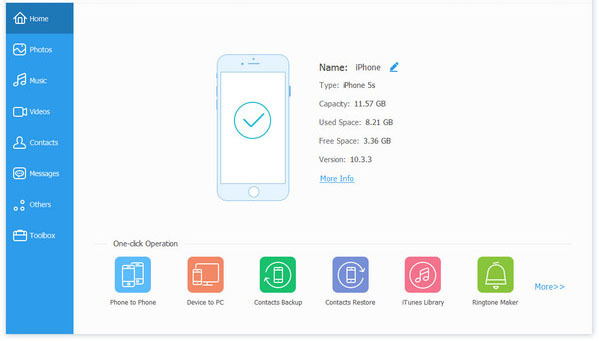 To save your time of taking free trial on all kinds of transfer tools on the market, we kindly recommend iPhone to iTunes Transfer or iPhone to iTunes Transfer for Mac to meet your demand. With the help of this powerful program, you can get access to your iPhone's memory on the computer, and go though all kinds files like music, photo, movie, playlist, books, etc. on your iPhone devices directly. And you can export and save these files from device to computer or Mac selectively or in a batch. After that, you can directly sync the exported songs to your iTunes library on the PC or Mac at ease. Click the below icon to get the free trial version and to see how easy the program works on your personal PC. Windows and Mac version are available here. So first of all, let's have a brief look on the primary window of the Windows version. Actually, the design of the Windows and Mac iPhone Music Transfer only have little difference. So the steps of transferring music from iPhone to iTunes on PC can also be done on the Mac computer very well. Thus, in the below contents, we'll only take the Windows version as an example. If you're a Mac user, please follow and perform the same step on your MacBook Pro or MacBook Air by yourself. 1) Connect your iPhone X/8 Plus/8/7/7 Plus or iPhone 6/6 Plus to the computer via its USB cable. Then launch the program for detecting your device. If it is not recognize your iPhone at first, you can click "Refresh" button to detect again. After that, you'll see the interface like the above picture. 3) Mark the songs you wish to sync to iTunes library, and click "Export" image button on the top menu and choose the option of "Export to iTunes" to transfer all your selected songs to the iTunes library with original quality. How to Transfer Music from iTunes Library to iPhone X/8/7/6S? During the using of your iPhone, you may also need to sync music from iTunes to iPhone, right? Below is the simple guide for your reference. Syncing music from iTunes to iPhone dosen't need any third-party tool. - Connect your iPhone device to the computer with USB cable, then directly choose the function of "Transfer iTunes Media to Device" or go to Toolbox and click "Transfer iTunes Media to Device" tool. - Choose the content that you wish to add to your device from the iTunes library in the pop-up window. - Click "Transfer" to begin the whole process. iTunes is also a good choice to sync your music from iTunes to iPhone X/8/8 Plus/7/6. Step 1. Connect your iPhone to the computer and launch the latest version of iTunes on the same computer. Once iTunes detects the connected iPhone, you can click the Device icon at the top-left corner. Then, iTunes will show the detailed information of your iPhone on its screen. Step 2. Go to the left sidebar to choose Music > Sync Music. Select the music files you want to sync and click Apply button to start syncing music from iTunes to iPhone.